About 50 million Americans are suffering from hearing damage. The number is increasing day by day. Even, every 1 of 6 people of all ages has an experience of hearing loss. Hearing loss can be the outcome for different reasons. But, in a study, League or Hard or Hearing finds that 33.7% people have been affected by prolonged loud noise. The advanced technology provides us many enthusiastic innovations to lead us to enjoy lives. The music industry is much more advanced to provide instruments to color the lives. Even, the latest headphones allow the people, especially the teenagers, to listen to the music. Consciously or subconsciously, listening loud noise through headphones affect for hearing ability. However, following proper instructions to use headphones won’t hurt you in the long run as well as keep the headphones safe. Hearing loss or called merely Hearing Impairment is a situation when one can’t hear sound for a short of time or for the time being. It’s the result of which ears or parts of the ears can’t work well. Also, the nerves that connect ear and brain can’t work as well. However, typically hearing loss is referred as deaf, deafness or hard of hearing. The great news is most of the problem of deafness can be cured by adequately applying for proper medicine. Physically, each ear has three inevitable parts to complete a hearing of sound. These are the outer, the middle and the inner ear. Damage of any part can create the problem of listening sound profoundly. The problem isn’t grown only for harsh noise. Instead, it’s the most common physical problem as about 30% baby born with deafness. Alternatively, it doesn’t affect only for the baby-born. Every year about 200000 cases are referred to the diagnostic center for lab testing. Isn’t it terrible, huh? But the most common hearing damage is the NIHL. It is an acronym of noise-induced-hearing-loss. It can cause loud and long-lasting sound around the people. But, sometimes the instant loud noise can create sudden hearing loss which can be medicated within a few days. Please include attribution to lowtechtimes.com with this graphic. 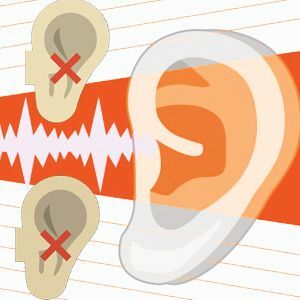 When sound can’t enter into the inner part of the ear from the outer or the middle part, conductive deafness is created. As the ear is divided into three essential sections, failure of any part can create hearing damage. Also, as the sound can’t go into the ear, loud noise can’t be helpful in this case. Even, any sound will be muffled until the roadway of the ear can be cleared. It’s a temporary case which can be removed by medical help. In the sensorineural hearing loss, sound can enter into the inner part of the ear. From there, the tiny hair cells in the cochlea can’t connect to the neuron of the brain. So, though the sound is entered, the brain can’t catch the meaning. The sensorineural impairment is somehow a permanent disease for the kids. It can result in them deceiving of normal conversation. Though it is cured in the long run the by applying the high-end medical treatment, constant loud-noise can damage them permanently. When conductive hearing loss and sensorineural hearing impairment coincides, the situation is called mixed hearing loss. The pathway of the middle to the inner part can be blocked or damaged in any way. So, sound can’t reach to the inner part of the ear. At the same time, the neural connection between the inner part and the brain is also damaged. Genetic predisposition from the parent(s) to the child. The older of ages, the harder of small bones (ossicles). Surgery in the head or the ear cause hearing loss. Medication with certain medicines results in deafness. By all means, it is a rare type of hearing loss which is quite difficult to be cured. However audiologist Mark Ross, Ph. D is hugely positive in mind of healing hearing during the loss. He recommends the systematic way of medication where treatment for conductive impairment comes first. If it’s successful, then you can go for sensorineural damage. It’ll take time to get the result but uncertainty is always there. A study from National Hearing Institute says, 1 out of 4 people in between the age 55-64 is suffering from hearing loss. For the age of above 65, the rate is 50%. Moreover, lots of people suffer sudden hearing loss which will last for 3 days. About 22 million regularly works within the profound level of noise, The Centers for Disease Control (CDC) says. They are the people of working class like factory workers, miners, soldiers, carpenters and construction workers. Their works create loud noise which affects negative impacts on health. It damages the inner part as well as sensorineural cells to connect the brain. It is shocking that 10% teenagers aged 6-19 have suffered hearing loss due to excessively loud noise. Genetically, like other traits, hearing loss can be transferred from a parent(s) to the child. It can be sensorineural, conductive or mixed. Moreover, a study from the University of Washington says, hearing impairment has 400 known genetic syndromes which can cause sudden deafness. Trauma or head injury plays a significant role in the hearing problem. Also, tumors in the head is another acoustic neuroma for hearing disorders. One of the hearing loss for tumors is the Tinnitus which may result in the deafness in either ears or one ear. Though tumors are removed medically or surgically, hearing is sometimes ignored to be restored. It may cause the hearing problem in the long run. Not only have the US but all over the world, senior citizens suffered much for hearing loss. In fact, it is a sorrowful problem for 50% people aged above 65 years. Presbycusis, the age-related hearing disorders, grows gradually for the advanced aged people. Moreover, the rate is higher for those who had been working for years in the manufacturing industry. Some ototoxic drugs which are used for medication can bring permanent hearing loss. But taking under physicians or specialists can’t harm you anymore. Hearing loss is a common phenomenon for the people not only the advanced aged but also all walks of life. However, American Speech-Language-Hearing Association along with other associations have identified some common symptoms for hearing loss. The first and one of the most well-known symptom to identify the problem. An affected person always rings in the ears to hear more precisely. It’s also a symptom of tinnitus which is a type of hearing problem. Most of the times, the typical disorder can be cured by using hearing aids. It seems to the person that the volume of the electronic device or the speaker is quite low. So, he urges to speak louder or to increase the volume. Sorry for the matter that, it’s become usual for the 20’s who use headphones to listen to the music. A frequent headache and fatigue are the outcome of deafness. The constant listening high volume may occur stress. Moreover, it is exhausted to listen to all-day conversations which create a headache. It seems that something heavy has been fallen from the head. It also creates sudden hearing loss which can last up to 3 days. It is absurd and embarrassing to misunderstand what people want to say. Often, the hearing disordered people pretend to understand everything. They are shy of asking which they can’t understand. As a result, when they want to share the information with someone else, they mislead the authenticity. A disordered man figures out that the people around him speak at a lower level. They can’t express themselves. But the people speak in a normal way which is seemed to be stifled. It looks like you hear a song with the cotton in your ears. Hearing loss prevents you from hearing the sound. So, when someone calls you by your name, you can’t answer. Moreover, when they talk to you, you feel no interest in the conversations as you can’t hear correctly. As a result, they feel embarrassed as well as reluctant with you. It may cause the problem for the usual relationship either in the family or friends. Surprisingly, a defaced man talk loudly over the phone. He thinks that the man on the other end of the phone also listens at a lower volume as he does. Even, sometimes the most frequent conversation is “can you hear me” which indicates the problem either in the mobile or the man. Listening songs at a high volume have the substantial effect on the ear. Even, study says that the 20’s people are profoundly affected by the syndrome. Even high-end headphones can’t save you if you responsibly listen to the music. Also, using sophisticated headphones for a long time can damage your ability of hearing. But a true headphone with all latest and high-end technology can help you avoid hearing damage. In fact, the audiophiles and headphone users should know how to prevent hearing damage. It has been presumed that using Bluetooth has the adverse impact on health. But International Agency for Research on Cancer Report, a collaborator of WHO, finds that Bluetooth has no adverse effect on health. Though the Bluetooth emits radiation, it is weaker than Wi-Fi or mobile antenna radiation. Also, as staying under a Wi-Fi area is safe, it’s no doubt that using Bluetooth is also safe for health. However, many of tech-reluctant health experts have refused the reports. They still demand to have an adverse effect of Bluetooth on health. So, more studies are required to get a final health report. Till then, we have to accept the most authentic and latest WHO’s report over Bluetooth. Noise Cancelling seems to be a new technology which gets popularity nowadays. But, it has been invented in early 90’s. However, the technology is a preferable choice for the audiophiles and the music connoisseur. It allows the headphones to demolish the surrounding sound. Hence, you can enjoy only the music without being disturbed. You can also use the headphones to listen to the dialogue of your favorite movie(s) or TV series as well as the conversations. Noise canceling headphones will completely cut off you from listening outside, sound. So, never try to wear the earbuds while walking on the way across the road. Avoiding loud noise is the best way to keep your ear safe. As sound is measured in decibels, the higher decibel indicates, the louder noise. Here is a list of decibels to apprise you about the sound. Loud events like concerts, nightclubs, sports events, etc. are an integral part of usual lives. Also, hanging out with the friends increase social relationship. So, to keep everything ongoing simultaneously, you can’t ignore participating loud events and activities. How to Keep Headphones Safe? Caring your headphone is caring your ship in the ocean. It’ll save your investment to use for long days. Also, keeping headphone safe and sound will get preferences for getting warranty or a replacement. Here are few tips to make you know how to keep headphone safe. Clean kit lasts for a long time. You can find thousands of headphones which covers are replaceable. So, untie the covers and clean them regularly. It will look like new after cleaning the headphones. However, while cleaning the headphones, make sure that the kit is unplugged from your device. An alcohol wipe or electrical cleaner will be helpful to kill bacteria or to remove any grime. Moreover, a toothbrush or a toothpick can be the great assistance for cleaning grooves from the hearing aids. Keep the nature of the way they live. So, trying to modify the headphone for listening to the music isn’t a good idea. So, keep the headphones simple as it comes and never mix with the speakers. Mixing will ruin the longevity of the kits and cables. The latest headphones come with protected case or bag. Keeping the earbuds in the case will save from being damaged or squashed. Wetting the kit can damage soon. It reduces the quality of the cable. Also, water can enter into the speaker of the earbuds which nips the sound quality. So, always try to keep your headphones dry. You can use the cotton cloth to remove water from the kit. Also, the electric dryer is the perfect solution to keep your electronics dry and clean. Tangling puts extra pressure on the wires of the headphone which cause them break or fray. Moreover, it can output low-quality audio which is harsh to listen. To stay the cables suitable for a long time, store them in the case neatly. Also, avoid unplugging the headphone by pulling the cables, instead use jack. Moreover, if you notice a break or damage on the cables, purchase a new extension instead of buying a new headphone. Listening pleasant sound is the utmost demand from a music connoisseur. Turning the volume up high doesn’t bring peace in mind instead of creating overstress on the headphones. Additionally, excessive noise will damage your hearing ability. It’ll reduce the efficiency of different parts by constant moving of the coil or transducers. Besides, using headphones beyond recommended audio limits won’t provide warranty or replacement guarantee for damaging your headphones. Read Also: If you are a gamer, you may need low hearing loss gaming headset then visit unitedtechguys’s best gaming headsets review and buyers guide. What’s the leading cause of damaging earphones? It huddles with the other devices kept in the same compartment. So, a wise decision to keep your earphones squash-free is having a separate compartment or using the own case. Hearing loss is one of the most common disorders among all age groups, but it is often ignored for years. Almost half of the people aged 50’s have the hearing problem. They are used to “just get by” with the hearing loss. Even, they are not interested in getting treatment instead of acknowledging it as a problem. However, the stones and the Who aren’t all to blame. Recently, the teen has been suffering much from the crux. Even, the toddlers aren’t away from the adverse of sound pollution. Here are some tips to reduce hearing loss which you can try. Ear wax is the most customary reason for the hearing problem. So, ear irrigation is the best way to remove wax from the ear. But, you should be careful when you want to clean your sensory organ. An unconscious moment can create severe problem to make you deaf. So, follow specific instructions from the pharmacy or visit your ENT specialists. Ginger tea is one of the best homemade medicine for almost all sufferings. Drinking 3 cups a day for 3 weeks will help you get well from hearing damage. To make a perfect spice-ginger tea, boiling 4 cups of water for 15 minutes. While boiling the water, put one tablespoon of each cilantro, sage, oregano, rosemary, and cinnamon. However, don’t forget to add 3 slices of ginger in the mixer. Like ginger-tea, Bone marrow soup is also healthy and helpful to cure some disease. But, in this regards of hearing loss, sheep’s bones or calves’ bones will add additional value to the soup. Mix 3 pounds of bones with 8 cups of water. Then add 1/3 cups of each black beans, adzuki beans, and kidney beans. Now mix them well. Next add 2 diced carrots, 2 diced celery stalks, one sliced onion and ½ cup of dried seaweed. Don’t forget to add one teaspoon of turmeric, cumin, and black pepper respectively. Boil them until the mixture is cooked well. But now the most important thing. Don’t use salt in the mixture before or after cooking. If you feel severe problem in hearing ability, visit your doctor or specialists as soon as possible. However, if you’re not sure of the problem either critical or not, follow the following symptoms. The sudden hearing loss is a common phenomenon for listening concerts or loud noise. Normal 48 hours is enough to restore the hearing ability. Though advanced aged people are familiar An acute the hearing problem, nobody is out of it. Sometimes, surgery is needed, or hearing aid helps to cure of the problem. However, the treatment is long-term or short-term, you shouldn’t ignore any physical problem.